A Pakistani IT firm has yet again shown the world that, despite the challenges we continue to face, we are second to none in innovation. On Sunday, the team at Pepper.pk and Five Rivers Technologies proved once more that we are a young but talented industy. 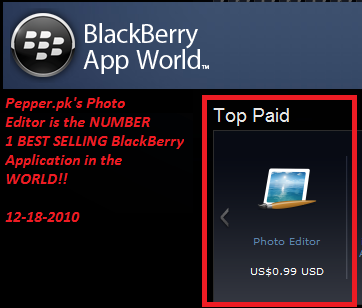 Their Photo Editor Suite developed for BlackBerry smartphones, in Lahore, Pakistan made it to the No. 1 slot on BlackBerry's AppWorld as the Best Selling appication across all categores! It had already been in the top 5 paid applications on the RIM App Store for some time. The news was broken on Tech Lahore's website – he's always the first to spot them. With over a million downloads, this app, and the young company that developed it, is certainly one to watch. They have only just scratched the surface and will continue to bring fantastic news our way. We share in their excitement and wish them all the best on a journey that has only just begun. It is companies like theirs that is going to show the big boys that we may be young upstarts in the world of IT, but we are going places fast!